Heather—the trouble with having nice things is that you have to worry about them. My grandfather was the first minimalist I ever knew. I mean it's not like his home was a museum or didn't have clutter, but rather he operated first and foremost in accordance with this minimal philosophy. Minimalism doesn't have to look a certain way and it certainly defeats the purpose if it is too rigid or feels like work. This is the minimalism that I’m after: streamlining my life to minimize stress, time, & worry. The older I get the more appealing trying to apply minimalistic strategies to my life becomes. When I think about adopting a minimalist approach to my life my goal is freedom; freedom from incessant decision making that saps my energy so I can have white space to think and create. I also love how an uncluttered and organized home feels luxurious and brings me into another elevated dimension. I often feel this way when I enter a sleek a beautifully merchandised boutique or hotel. It's the ultimate luxury and way to care for yourself. Adopting a minimalist aesthetic can be done easily if you begin with small changes. Minimalism begins as a change in philosophy in how you edit your life and is often about cultivating the fortitude to say no &/or allow the extraneous to fall away. This is not always easy to do, but if you can make it a priority and be consistent the magic will come. Freeing up space in your life by embracing minimalism unlocks huge reserves of energy that were formerly spent tending to clutter and clunky inefficient systems. 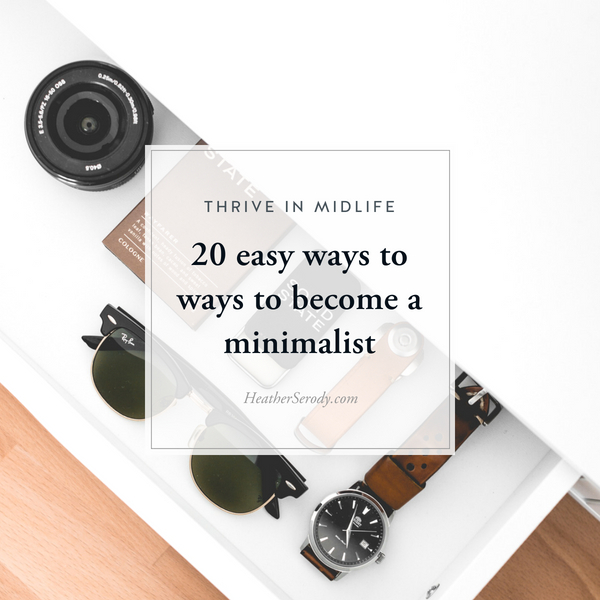 I've got a few easy ideas for you to pick from to experiment with incorporating minimalist If you want to adopt some minimalist strategies into your life. Get organized in one day. Get rid of your cable/direct TV: become an internet-only media consumer. Live with less clothing: only keep clothes you wear & love. Donate the rest. Simplify your makeup routine: use only clean makeup that can take you from day to night & throw the rest away. Clean out the fridge and toss ALL condiments you haven't used in the last 2 months. Clean out the pantry and toss any food you haven't used in the last 2 months. Take everything off your kitchen counters that you do not use on a daily basis. Store out of sight or donate. Implement a spending freeze. Don't spend any money on anything that isn't necessary for one week. Calculate your savings. Clear your desk of everything except your computer and a light. Only schedule doctors appointment on one particular day at a convenient time to minimize interruptions to your work week. Silence all audible notifications on your devices. Unsubscribe from all mailing lists you no longer want to hear from. Limit your email time to a set amount of time at the beginning & end of the day. Set your smartphone to automatically go into silent mode in the evening to allow you to decompress and wind down for bed. Buy only white sheets and towels. Keep only one kind of socks so you don't have to worry about matching them when doing laundry. Set up automatic delivery of pantry & household items you run through every month – paper towels, dishwasher detergent, laundry detergent, toothpaste, shampoo & conditioner, etc. I use Thrive Market for this and save 25-50% off retail prices. Get your grass fed and organic meat delivered from Butcherbox. One less thing to think about. How do you adopt minimalism into your life & make it work for you? I'd love to know!